The script by Holly Black is hilarious. There's a lot of the same dark comedy that made the original Lucifer and The Sandman so enjoyable. 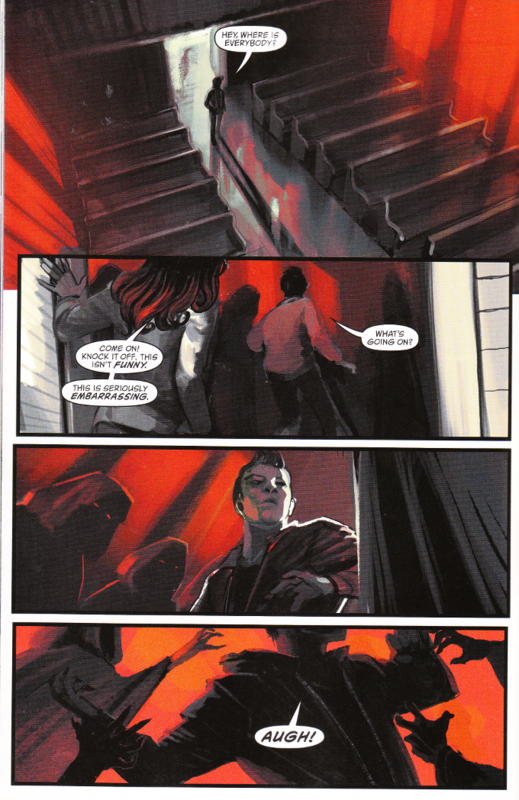 More, Black manages to sneak in some information about real-world Satanism (i.e. it's not the same as devil-worship) which only serves to make the ending of the issue all the better. The artwork by Stephanie Hans proves equally skillful. The palette is heavy on extremes, with deep blacks and rich reds offset by off-whites and pale blues. This gives the whole issue an ominous feeling, even amidst the hilarity, creating a disjointed effect that subtly informs the reader that something is off though they aren't just sure why! If you haven't given the new Lucifer series a try, this issue is an excellent starting point. It perfectly captures the twisted humor of Mike Carey's one-off stories and the artwork by Stephanie Hans looks amazing. It is highly recommended for all fans of classic Vertigo Comics!